When I first heard that there was going to be a “big announcement” from Wizkids at Gen Con, my guess was that it was going to be at sports clix game, since they had just been acquired up by Topps a month before. To all of our surprise the announcement was Mage Knight 2.0, a revamped Mage Knight, which is now among us, and has drastically changed the face of Mage Knight gaming as many of us knew it. The Basics: new dials, new rules, and now objectives too? The first noticeable improvement is a redone combat dial. The L shaped window was cut out a bit more, no longer resembling an L, and allowing for placement of the “ability nexus”, essentially the placement of an ability color pointing towards the associated stat, allowing for more than one ability on Speed, Attack, Defense or Damage, what ever the case may be. The arcs are now more distinct, outlined by lines extending to the front of the base. Additionally the placement of the stats slot is now on the rear of the dial, as opposed to being up front, as it’s positioned on the entire line of pre-2.0 figure dials. The range for figures with a ranged combat attacks is in the same place (on the right-hand side of the stat slot), but next to it you’ll now find a constant ranged combat damage value. The damage value in the stat slot now only applies to close combat attacks on 2.0 figures. The benefit of this is that once the stats drop, the ranged combat damage value stays the same, which makes sense, since an arrow will do the same amount of damage no matter when it’s shot in reality. All of the previous Mage Knight figures featured a sword next to the attack stat on the dial, in 2.0 you’ll now find a sword, bow and wand attack types, defined by the appropriate symbol on the dial. You may also find a number in a circle next to a stat value; this is the bonus the figure gets when utilizing their sword, bow or wand, again, what ever the case may be. In most cases it’s a +1 or +2 to the attack value. The defensive symbol has also been expanded to include a shield with a want inside of it, this is the Magic Immunity Defense Type, which works the same way as the old Magic Immunity ability. All new combat proficiencies and bonuses are also attached to the sword, bow and wand attack types. For instance, only bow attack type can perform Precision, which allows the firer to shoot into combat, at a penalty of -2 to the attack roll. Bow also is allowed the Point Blank proficiency, which allows the firer to add either +1 to the attack roll, or a devastating +1 to the damage value if the target is positioned at under half of the firer’s range value. So a target at 6-inches or less, when the firer has a 12-inch range can be subject to a Point Blank attack. Bombardment is also a new ability, granted only to figures with the bow attack type. Think of it as artillery, as a token like that included with Wizkids’ Mechwarrior artillery pieces is included with pieces with the bombardment ability. Bombardment is executed a little differently, but nonetheless it’s an ability that allows for some serious long-range attacks previously absent from the game. Ranged Combat Formations also work differently now under the 2.0 rules. If the contributor to the formation has the bow attack type it can either modify the primary attackers attack value by +2, or the damage value by +1. To allow the use of pre-2.0 figures in a ranged combat formation pre-2.0 figures without the bow attack type can just modify the primary attackers attack value by +2. Close Combat Formations have been replaced altogether by the Gang Up proficiency, which now allows friendly figures of different factions, but must all have the sword attack type to gang-up on an opposing figure. The catch and bonus is that the figures contributing cannot have an action token already, but they don’t receive one for the action either, and each contributor adds +1 to the attack value of the primary attacker. That makes for some more devastating close combat action. Surge is by far the most beneficial sword attack type only proficiency, as it essentially allows the figure to charge and attack in the same action, but the figure making the surge must take one click of pushing damage, before resolving the attack, which forces the player to use the stats after the push to resolve the attack with. Capturing is also a sword attack type exclusive proficiency now, and the captor then gives up what ever speed type they had previously for the boot speed type (eliminating the wing, horseshoe or wave speed type), but unlike before 2.0, the captor can now eliminate the captive with the penalty of -3 to the attack, if they so choose. New speed types have been added too they are boot, wing, wave and horseshoe. All of the previous mounted 2.0 figures now have the horseshoe speed type, which allows them to use the Double Time proficiency (moving at double their speed value), only without the associated single click of pushing damage penalty. Boot speed type can use Double Time as well, but will take a click of pushing damage for doing so. Wave speed type allows those with it to move through water as clear terrain, and when in water they receive +2 to their defense value as well. Wing speed type somewhat replaces the flight ability of pre-2.0 figures, but adds the means to spend half of their speed value to move between Soaring and Ground Level flight. To show a figure at soaring level they’ve included clear plastic shot-glass size flight stand, which features a very nice figure clicking mechanism on top as well. So when at soaring level a figure can only be in base contact with another figure at soaring level, and grounded figures can only attack a soaring level figure with ranged combat attacks. Soaring doesn’t block line of sight, nor does it interact with terrain features. The way the game is played out has also changed drastically. Controlling objective tokens is the way to victory now. Granted if you completely wipe out the opposition as before you’d also win the game as well, but it’s not quite as easy to do that as it was before due to the new armies and tactics being employed now, since it’s now a game of controlling objectives, as opposed to all out slaughter. There’s also three phases to a turn now the Command Phase, Action Phase and End Phase. In the command phase you give orders that are specific to the command phase, if applicable. The action phase is where you issue commands to all of your warriors. The end phase is where you check for control of objectives and remove action tokens that need be removed. At the start of the game a single objective token is placed in the center of the play area. 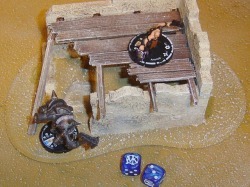 Each player now places one each of the remaining two objective tokens, after terrain is placed. Visually speaking, the new figures are gorgeous, by far the best pre-painted miniatures on the market today. They’ve really outdone themselves this time out, as the detail and paint operations set a new standard for pre-painted plastic miniatures. The sculpting is also equally as outstanding, and the 2.0 set includes a new variety of familiar-looking characters, only they’re all new for 2.0. For instance the MageStone Golem resembles the popular Blade Golems from Rebellion and Unlimited, but is a completely new redesigned figure. The orcs are far more detailed than ever before, making them some of the nicest looking figures in the set. The ever so popular Bone Golem from Rebellion and Unlimited has a doppelganger too in 2.0, as the Skull Golem looks strikingly familiar. The elven figures are also breathtaking, and really convey the look and feel of a medieval elven army more than ever before. The factions have also been revamped and changed around a bit. It appears that the Knights Immortal were dropped altogether, as the new factions are Elemental Freeholds, Elven Lords, Orc Khans, Solonavi, Draconum, Dark Crusaders, Black Powder Revolutionaries and the Atlantean Empire. The Atlanteans are the previous Atlantis Guild, Black Powder Revolutionaries replace the Black Powder Rebels, Dark Crusaders replace the Necropolis, Elemental Freeholds replace the Elemental League, Orc Khans replace the Orcs and Solonavi and Draconum appear to the stay the same, and the new Elven Lords seam to break the elves free from the previous Elemental League. It doesn’t end there, as there are sub-factions present too, each of which grant special sub-faction abilities to those part of each faction. Golemkore and Imperial Legion fall under the Atlantean Empire. Golemkore grants Field Repair to figures with the Golemkore symbol on their dial, which allows them to repair friendly figures with the appropriate damage type. It should also be noted that some units in 2.0 now have repair markers on the dial just as employed in Mechwarrior, forcing players to repair only to a repair marker, and not allowing a repair when one is showing. Imperial Legion grants the Rally ability to Demoralized figures at the beginning of the command phase to heal 2-clicks, and if a captor to eliminate it’s captive without a close combat attack. Bloody Thorn appearing on the dial grants the Sniper ability to Black Powder Revolutionary figures, allowing it to change facing at any time during your turn, and decreases the defense value of targets by -2. The Northlanders sub-faction ability allows Black Powder Revolutionaries with the symbol showing on their dial to reveal two, instead of one terrain card, and to select which one you want to use once the other players have done so, as long as over half of your army fields Northlander sub-faction figures. Revenant works very much like Necromancy for Dark Crusaders, as it allows a non-demoralized figure of this sub-faction to reanimate any figure (no multi-dial or titans), turn its dial to the starting position and place it in base contact with the Revenant sub-faction figure and to use this figure for the entire turn, but at the start of the end phase this figure is removed from play. Order of Vladd also falls under Dark Crusaders and grants Vampirism to Order of Vladd sub-faction figures, allowing them to heal for a click of damage when inflicting at least one click of close combat damage to an opposing figure. Elven Lords Free Armies sub-faction figures gain Forced March, allowing all Free Armies figures to move at this figure’s speed value, instead of their own. Temple Masters Elven Lords sub-faction ability grants Gallant Defense, allowing all Temple Masters sub-faction figures in base contact with this figure to use this figure’s unmodified defense value instead of their own. Broken Tusk is a fitting name for an Orc Khans sub-faction and grants Broken Tusk sub-faction figures Reckless ability, allowing them to take one click of pushing damage to increase their own damage value when successfully making a close combat attack, and they can continue to do so until the figure is either demoralized or eliminated. The Lurk ability is granted to Shadow Khan Orc Khan sub-faction figures, allowing them to decrease any damage dealt to them by 1 (except for pushing damage), and gains them +1 to their defense when in concealing terrain. Unfortunately there are no sub-faction abilities for the Draconum or Solanavi, which is disappointing since the Solanavi is one of the strongest, but most overlooked factions in pre-2.0 Mage Knight. Only one Solanvia appears in 2.0 and it just so happens to be one of the best figures in the entire 2.0 set the Solanavi unique Varatrix. Equally as impressive are the three Draconum uniques Vithzerai, Caldera and Drakkor, but aside from those four figures, Mage Knight 2.0 includes no other Solanavi or Draconum faction figures at all. Speaking of uniques, the base of unique figures are larger in circumference than regular 2.0 figures, and include slots for outfitting the figures with relics and other items (at present only relics are available, but due to some wording in the rules, I got a notion other types of items will be present before long). Mage Knight 2.0 also introduces plastic cards, which can be relics, domain cards or pre-constructed terrain pieces, all of which come randomly one per booster pack, and two per starter. Buy one booster and you may end up with a single relic card, purchase another and you may get another relic card, your next purchase may give yield you a domain or pre-constructed terrain card. The beauty of the cards is that they’re made of a hard plastic, and are designed so that you can pop out the relics and place them in the slot on the unique base, and when done replace the relic back into the card. The same is true of the pre-constructed terrain pieces, but most require that you have all three cards to construct a Stone Watchtower, Rawhide Pavilion, etc. Some are single card pieces too, but twelve of the twenty-eight cards create four 3-part terrain pieces. Domain cards are played at the start of the game, and can drastically change the way the game is played since they can limit the movement or range of figure, and when two are played that don’t cancel out each other some very interesting scenarios can arise. For instance in one game a player and I ended up not being able to shoot farther than 6-inches, and having movement limited to 3-inches, due to the effects of both cards being played. What a game that was! There are twenty Domain cards in all in the 2.0 set. Relics really change the way the game is played as well, and can make a unique or LE with relic slots super powerful. For instance, the Paladin’s Great Sword adds +2 damage when making successful close combat attacks against multi-dial or titan figures, and when it succeeds in close combat against a figure with Zombie or Skeleton in its name that figure is completely eliminated from play. The relic also adds +1 to the defense of the wielder and costs an extra 28-points to wield, which is included in your overall build force total. That’s not even one of the meanest weapons one could wield, but it gives you an example of how one could easily beef up their existing unique and 2.0 LE figures (since all of the 2.0 LE figures have slots for items). Some may add +1 or +2 to the attack roll, and maybe even a bonus to the defense as well, but may also require a -2 to the speed value of the wielder, so many have negative effects on other stats. To keep things from getting too out of hand they’ve incorporated the Rule of Three, which essentially puts a cap on modified values, so that no modified value can ever be more than +3. Still +3 is a lot when you outfit a figure like Vithzerai who already has an extremely high attack value, a constant range damage value 5, and a starting close combat damage value of 5 with an item that increases his already high defense, movement or damage values, making it a pretty unstoppable beast to slay. I should also add that most relics also have specific requirements in addition to the point cost to wield them. For instance the Treefell relic requires an Orc Khan figure with the Sword attack type to wield it. Most ranged weapons like rifles and bows require either a specific faction figure with the bow attack type (like Black Powder Revolutionary and a bow attack type to wield the Snow Fuser Rifle), or just a figure with the bow attack type. So specific attack type uniques and LEs, are limited to wielding relics requiring their specific attack type. Compatibility with pre-2.0 Mage Knight figures? When first announced it seamed clear that the combination of new powerful figures, with abilities not utilized by pre-2.0 figures and the addition of relics would make the new 2.0 figures so much more powerful than the pre-2.0 figures. Now that I’ve seen first-hand the abilities and advantages of 2.0 figures, I’d have to say that it’s not quite as bad as one might think for the pre-2.0 figures. For instance, since all pre-2.0 figures all have the sword attack type they can all take advantage of the sword attack type proficiencies like Surge, Gang Up and Capturing, and the Double Time speed proficiency, which can make even a lowly 5-point Imp a figure that can run up and slap a foe before ever taking any damage, something that previously wasn’t an easy task, since Imps usually ran interference, were used solely as point filler and were considered disposable points, and was normally was taken out with a single blow from the opposition. Pre-2.0 figures with the Flight ability are still useful too, as the Sinister release Solanvi figures are all still quite the beasts they’ve always been, the only disadvantage that they have, and other pre-2.0 flight ability figures share is the lack of being able to Soar since they don’t have the wing speed type. Meaning they can’t go base-to-base with a soaring figure, but they can still fly and not interact with terrain for movement purposes, and they’d still break away on a anything but a roll of 1 on a single D6. As a bonus all of the mounted figures automatically get the horseshoe speed type, giving them the means now to move double their movement, without the penalty of pushing damage, which boot speed type figures would take. However, aside from the mounted figures, all of the other pre-2.0 figures are also boot speed type, gaining them the benefit of double time (as long as they don’t have flight, which cancels out double time) with the pushing damage, which is still an ability that they didn’t have previous to 2.0 rules. In 2.0 you may have a powerful unique that cost you 200+ points to field, with relic and all, but if it has any attack type other than sword it can’t capture anything for you, but a few lowly pre-2.0 Mancatcher figures can still get the job done in no time. If anything 2.0 makes many of the pre-2.0 figures undercosted for the abilities that they’ve now gained, so it will be a while yet before the pre-2.0 figures go out of style, as most are still very useful, and many of which that weren’t of much use before may be discovered as new diamonds in the rough due to the 2.0 rule set. Mage Knight 2.0 brings a plethora of all new special abilities to the battlefield, some of which many players are already complaining are broken. For instance, the new defensive special ability called Ghost Form cannot be affected by Pierce or Bombardment due to it protecting the figure from being the target of any ranged combat attacks. The Solanvai unique from 2.0 Varatrix could go to Soaring, and while he has Ghost Form, no one other than another soaring figure could touch it, leaving the opposing player in a pickle if they don’t have a soaring figure that can go toe to toe with Varatrix. Making matters worse for the player at the disadvantage, Varatrix also has Counter Attack, which gives him a free counter attack when a player misses with a close combat attack against him, and if he’s not down on his dial at all that’s as high as 5 clicks of damage being dealt in the counter attack, which is a free action for Varatrix. Further adding to his arsenal is Crushing Blow a damage special ability, which grants him the means to attack and completely ignore all defensive special abilities, thus hitting hard right through toughness, invulnerability, etc. Sure there are tons of figures from pre-2.0 Mage Knight that could easily go toe to toe with Varatrix, but since pre-2.0 figures can’t soar, and if Varatrix is soaring they can’t even touch him unless he decides to come down to ground level, and why would he with that advantage? At present it appears the only figure that can take him out is another Varatrix, or being ganged up on by a bunch of other soaring 2.0 figures with a soaring 2.0 unique as the primary attacker. The only ability that I’ve seen that might be able to wear down a ghost form ability figure is ShockWave, a pre-2.0 ability, which is a Special Action, not a ranged combat attack, which causes one click of pushing damage if successful. On the other side of the coin, Vartrix’s ghost form keeps him being able to be to be healed at range since it takes a ranged combat action to heal him with Magic Healing, and this can't be done as long he has ghost form showing in the defense slot of the dial. Another devastating new ability is Thunder Blow (limited to sword attack type), which allows the attack if successful on the first attack to keep attacking and adding +1 damage for every other attack that succeeds after the first, but decreases the attack value by -1 for every one after the first. Khan Harowblade an Orc Khans unique from the Broken Tusk faction has Thunder Blow with a base damage value of 5, and can use Reckless as well, making him one extremely tough brawler to tend with in close combat. Stormfire (limited to the wand attack type) is similar to Flame Lighting, as it does the full damage at range to the target figure, and 1 click of damage to each figure in base contact with the target. Hex is very much like Probability Control in HeroClix, as you add a hex token to the figure using it, and until the beginning of your command phase any single attack rolled within 18-inches of this figure can be made to re-roll the attack, be it a friendly or foe figure. Pathfinder is a speed ability allowing this figure to treat all hindering as clear terrain and any figures in formation with it gain the ability as well. Limited to the bow attack type is Arcing Fire, allowing this figure to ignore figures bases for line of sight purposes, essentially shooting in a volley manner. Some flying figures can also rely in the Strong Flier speed ability, which allows them to carry another figure that hasn’t acted in the same turn, but must end the movement action in base contact with the carried figure. Once the movement has ended the carried figure receives an action token as well. This is a nice way to pick up and move out a wounded figure, to bring it back to a healer. Submerged is a speed ability, allowing a figure to deploy in water anywhere on the battlefield after all players have deployed their figures without submerged, but the figure can’t be deployed in base contact with an opposing figure. Think of it as aquatic infiltrate. There’s also Infiltrate now too, which allows you to place this warrior outside your deployment zone in hindering or concealing terrain up to its speed value away from the deployment zone. If deployed outside the deployment area mark the warrior with an action token. Smite is essentially a variation on Sweep, is exclusive to sword attack type figures, but only it does damage equal to the attackers damage value to every other figure in base contact with the target, as long as the attack succeeds against their defense values too. On the downside the attacker takes on click of pushing damage once the attacks have been resolved. Parry is another sword attack type exclusive ability, which allows you roll a single D6 and subtract 2 from the result, and then the result is the amount which the attacker’s attack value is reduced by, effectively furthering your odds of not being hit by a close combat attack. Lastly Overwatch is a bow attack type exclusive ability, which is odd in execution, because it allows you go take an overwatch token (included with starter) and to do nothing on your turn, then to resolve a ranged combat attack at the beginning of your next command phase. Surprisingly if you go looking for Mage Knight 2.0 in stores you won’t find packaging that defines the product as Mage Knight 2.0. Instead it appears that before it shipped they dropped the 2.0 from it, and left it identifiable as just “Mage Knight” but the new packaging design gives it away, because boosters are short and more squared now. Each booster comes with four figures and a random card (it could be a relic, domain or constructed terrain card) for $7.99 per booster. Starter sets run $19.99, and surprisingly are a good value since each starter comes with nine figures total, two random cards, the objective, controlling and two-sided hex/overwatch tokens, a pair of dice, a 28-inch flexible ruler, the new rulebook, abilities card and a Kierin Starsdown Elven Lords unique in the window box at the top of the starter set packaging. The starter box unique is actually pretty useful, and it’s nice to see that they made it more enticing to buy a starter set by adding a specific unique to the assortment. I should also add that you can actually find other uniques in starter sets too, as the first starter I purchased contained Varatrix and Kierin Starsdown both, the third one Black Thorn and Kierin Starsdown both, so your chances of getting other uniques from the set in starters may be just as good as buying boosters. Before 2.0 came along many clix enthusiasts were growing tired of Mage Knight. Since the release of 2.0 there’s been an increased number of not only new players showing up at local venues to play, but many of those who previously got out are now being drawn back in to Mage Knight, myself included. It’s hard to knock it, because quite frankly, it’s a long overdue, yet very welcome improvement to the game, one that makes the game more challenging, more fun and downright more interesting than it was before. The miniatures are better looking than ever before, and there is a little something for everyone in terms of the variety offered by the 2.0 line with 130 figures in all, 16 of which are uniques. Thankfully all of the pre-2.0 figures also retain usefulness as well, so you really haven’t played Mage Knight until you’ve given the new Mage Knight 2.0 shot. Mage Knight 2.0 is by far the best clix game that they have going for them at present, and Wizkids more recently announced the first expansion called Mage Knight: Dark Riders, which is set for release this coming April 2004. Dark Riders sets to revamp mounted figures, by offering figures that are removable from their mounts, and an all new assortment of figures, including Avatars of Apocalypse uniques (essentially new four horsemen, which were only previously available as super rare chase pieces from Mage Knight: Sinister, each of which would always bring $1,500+ each every time they’d appear on eBay). 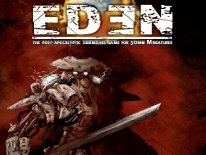 This article was originally posted at GamingReport.com back in December of 2003. Since then, Wizkids ceased business, and only recently was re-launched by a new parent company NECA in late 2009. At present the only pre-NECA Wizkids' game that they revived is HeroClix. After Mage Knight was shelved, the old Wizkids, under the Topps banner released a Mage Knight-like game called Dreamblade. It looked like a good game, with some really nice looking pre-painted minis, but it failed miserably. Looking back it now, Topps was a really bad choice to run a company like Wizkids. As soon as Topps bought them, all of a sudden everything was pushed to include cards, and even entire games based on styrene card models like Pirates of the Coast, and the cool, but failed Star Wars TMG started to surface. It's evident that they wanted to do more with cards, than miniatures, since the cost of making the cards was so much cheaper than making the miniatures, and how they pushed the card products, seamingly more than the Clix products towards the end. Even today Mage Knight can still be a lot of fun. Whats more, the nice thing about games that are no longer published, is finding the deals on the product out there. On eBay now you can find boosters for dirt cheap, and some really nice lot deals, since people would rather get something out of an old game they no longer play, and that has sat collecting dust in a closet for the past few years. There's still 2,000+ items in the Mage Knight category to be found on eBay too. I also still feel that Mage Knight, or any of the Clix games for that matter, is one of the best options out there to help introduce younger players to the miniatures/wargames genre.